Above, Tulipa ‘Burning Love’ (the name reminds me of the Elvis Presley song) receives center-stage on the broad sill in the Music Room. The flowers are redder-than-red, and they really sparkle when sunlight strikes them. Sturdy, 10-inch stems hold the flowers attractively upright. Do consider this one for planting indoors or out next autumn. 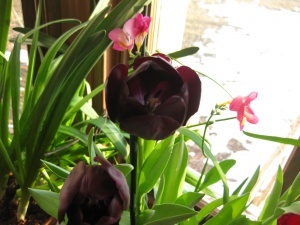 A nice companion for ‘Burning Love’ is the regal Tulipa ‘Queen of the Night’ (above), with deep purple, almost black blossoms. My only complaint with her majesty is the too-long stems. Without staking, the flowers tend to sway, and not too gracefully, either. 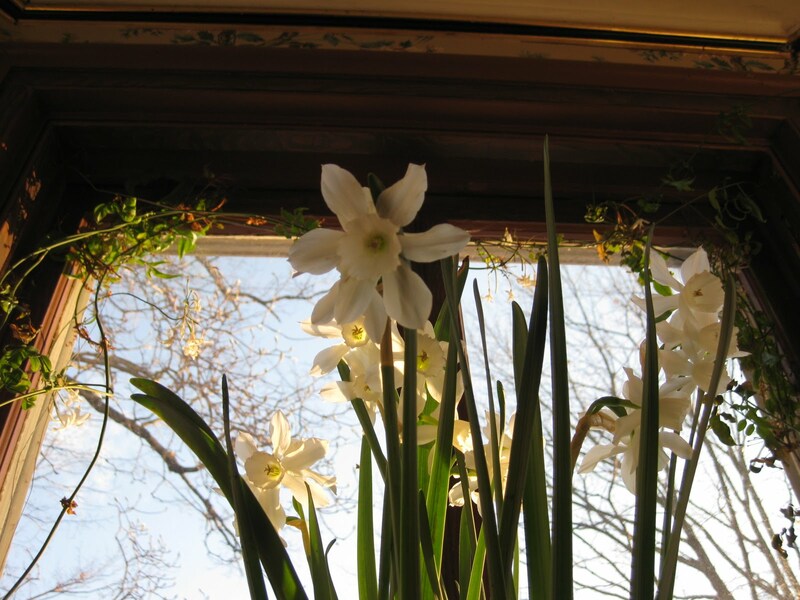 Adding fragrance to the window garden is Narcissus ‘Avalanche.’ This one flaunts gold-cupped, white-petaled burdens on towering 16-inch stems. Just a few open blossoms perfume the whole room. 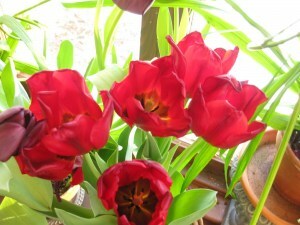 I used two pots of Avalanche to frame the red and purple tulips there. 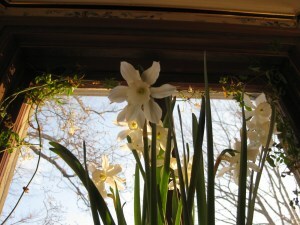 Not fragrant at all, but a Victorian delight, is Narcissus ‘Thalia.’ I have it on the top shelf in the Music Room window. 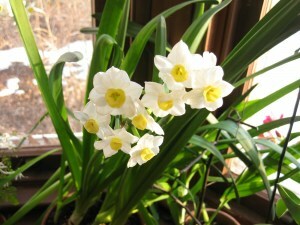 This popular old daffodil features ghostly-white trumpets of bloom on sturdy, 12-inch stems. Scenting my parlor is Muscari, the common grape-hyacinth. Here, the clusters of soft-blue flowers display well in a shallow, blue and white china bowl filled with pebbles and water. The bowl is set on a round mahogany table in a west window. 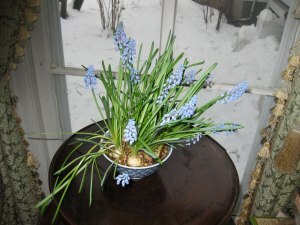 If you have any left-over muscari bulbs in your cold garage, try forcing them now in a pot of soil or a bowl of pebbles. You’d be surprised how quickly the flowers emerge. 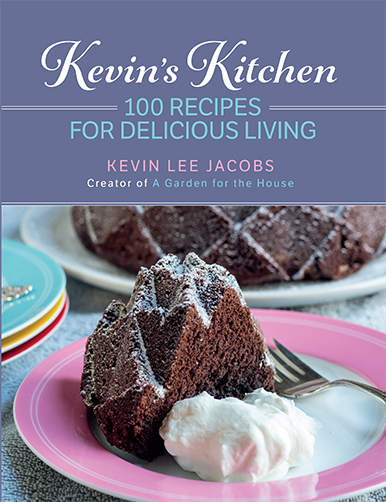 Want more gardening fun? 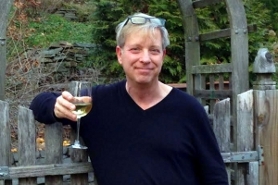 Be sure to sign up for Kevin’s weekly newsletter. 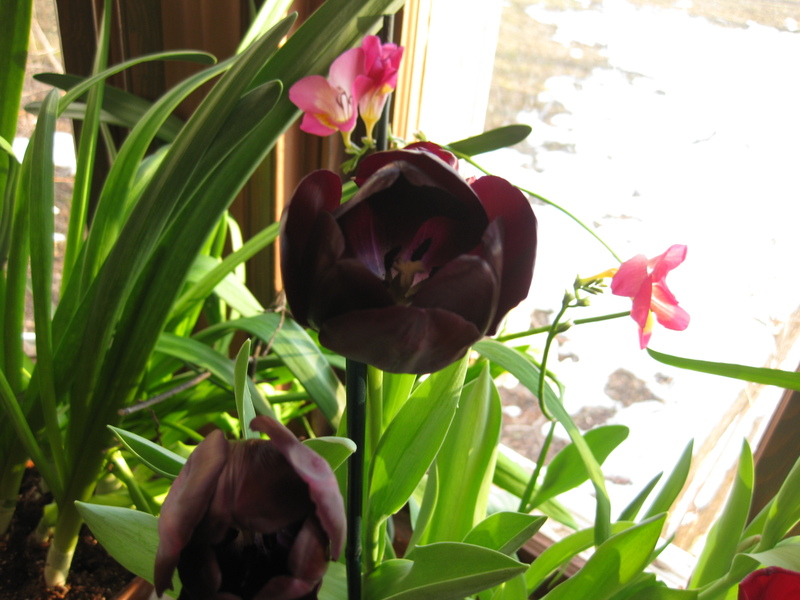 Kevin, I have Queen of the Night tulips in an east window. They do bend and droop, but they are beautiful and welcome nonetheless! I love your white and yellow Avalanche daff. I'll have to order that one in the fall. Nice shots of your flowering bulbs, with snow in the background. Thanks for sharing. 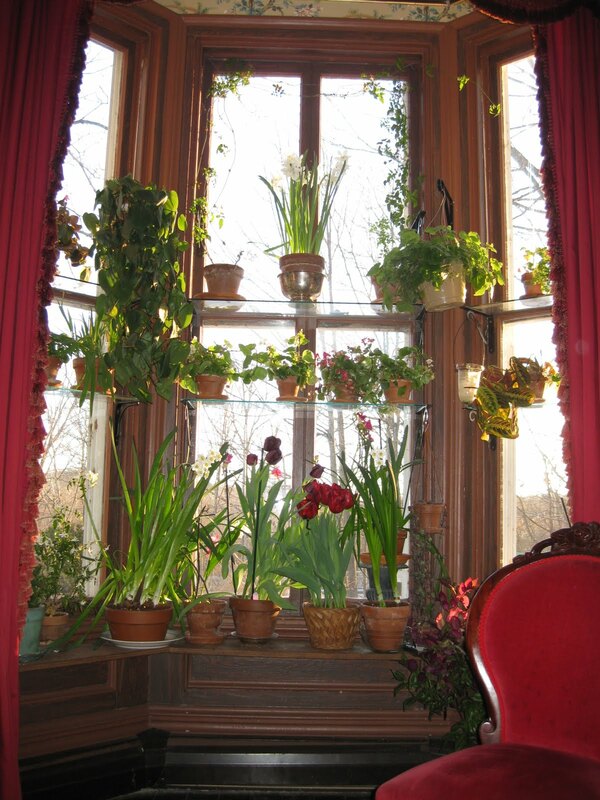 Kevin, I really like your plants, and also the shelves in your window. Are the shelves glass or plexi? Where can I buy them? Are they expensive? Alan – The shelves are glass, and they cost me no more than $10 each. Scroll up, and click “How to Design A Window Garden,” and also “Seven Ways to Beautiful Houseplants.” In these two posts you will more window-garden pictures and information regarding the shelves. Thanks, Kevin. I really like the look of your gardens!